With so much focus these days on sustainable living and fresh, home grown food, edible gardening has become incredibly popular. But what if you don”t have an allotment or even a large amount of garden to devote to fruit and vegetables? 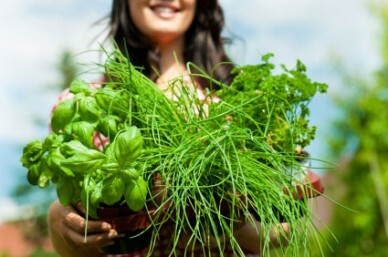 Well all is not lost as the experts at have compiled a few tips on how to grow food-producing plants in the smallest of spaces. When you think of edible gardens your thoughts might immediately turn to colourful options like fresh berries or tomatoes. However, edible green herbs are some of the most convenient home growing options and they are easy to mix in with an existing garden scheme. A sunny windowsill can produce an abundant crop of aromatic basil or coriander for weeks, while mint and chives will also flourish indoors. A few old Tetrapak cartons sown with “cut and come again” lettuce can provide salad leaves all year. Fresh herbs are so much better than dried and even if you only have a balcony or tiny courtyard garden a single sage or rosemary plant will provide more than you could ever use once established whilst also providing a lovely aromatic scent. Rhubarb will grow happily in most standard garden soils, will grow in the shade, keeps producing year after year and will suppress weeds. It’s about as close to maintenance free food as you can get. Most people have a few thoughts that quickly come to mind when considering edible gardening. However, you should take some time to research options that suit your situation best. It goes without saying that you should grow what you like to eat but the final choice of plants will depend on other factors such as how much sun your plot gets and how much time you can spend tending it. With limited space look to grow the most interesting crops that will save you money. Potatoes are easy to grow, but are also very cheap to buy and not very exciting. Whereas asparagus is expensive and tastes so much better when fresh as its natural sugars have not yet broken down into starch. Grow perennials. This reduces the annual need for buying potting compost, seeds etc and the less cultivated varieties often suffer less from pests. Try old heirloom varieties, or unusual vegetables like Seakale and Oca. There are numerous ways to use vertical space to grow edible plants at home. Whether it means using a vine plant such as tomatoes or squash to dangle on a railing, or trying something like these amazing hanging boxes or gutters with miniature gardens inside them. Vertical space is always available but so often ignored and is the perfect way to optimise your area and make a unique and functional veggie plot. With some thought you can create an edible paradise right outside your front door, with strawberries and tomatoes tumbling seductively from hanging baskets, runner beans climbing over a door arch and window boxes brimming with nasturtiums, spring onions, radishes and beetroots. Just as containers can be stacked vertically to conserve space, many plants you may imagine requiring garden space can be grown quite effectively in small containers on a porch or windowsill. For example, strawberry plants can be grown in relatively small pots and, properly planned, can provide you with fresh berries throughout the summer. With no stones or hard clay to restrict their growth, crops such as carrots, parsnips and leeks can do especially well in deep containers filled with suitable compost mixed with a little sand. If you are restricted to small containers, you can harvest large varieties early as baby vegetables or grow dwarf varieties, such as round, ball-type carrots or dwarf French beans. There are even miniature varieties of pumpkin! Remember though, that any plants grown in containers are in a restricted environment and are limited in how far they can send their roots out looking for nutrients and water. Make sure you keep pots well watered – standing pots in a large tray or saucer helps with watering for indoor plants. Just beware of over-watering. All containers need holes for any excess water to run out and a layer of stones or broken terracotta pots at the bottom can also improve drainage. A layer of mulch on top will help conserve water. Abandon the conventional and play around with ideas to get the most from your available space. Could you set up a trellis on the windowsill and grow some dwarf peas indoors among those herbs? Don’t write off the front garden and forget about the concept of “the vegetable patch” – just grow your veg in amongst your flowers. Colourful frilly lettuces and Swiss chard look great in a flowerbed and the mixture of plants will help confuse pests. For plants in containers, why not try running a “wick” through the pot or fill a small yoghurt pot or drinks bottle with water, make a single tiny pin-prick in the bottom, set it on top of the soil and see how fast the water drips out. Add more pinpricks until the flow is just right to keep the pot watered over as long a period as possible. All that’s left to do now is sit back in a comfy garden chair and watch your dinner grow around you. Nate Emory is a freelance writer and frequent guest blogger. He covers a wide range of topics related to home and garden.